Hollerado are gearing up to deliver their final album Retaliation Vacation, and while the record still isn't out for a few months, the Canadian band are showing it off some with a new track. What's more, they have expanded their upcoming farewell tour. 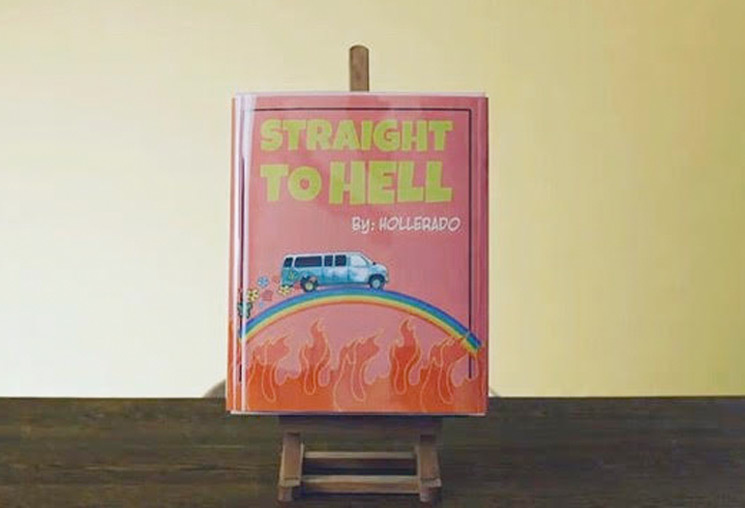 After giving us album track "One Last Time," Hollerado have now shared the record's "Straight to Hell," which has arrived alongside an ambitious lyric video. As you'll witness, the clip features an incredibly detailed and hand-crafted pop-up book. After listening to the lyrics to "Straight to Hell" I began to think about growing up with religion and how when you're a kid, you can be taught these lessons and beliefs that don't always hold up as an adult. Keeping with that train of thought I ended up on the idea of the pop-up book — which is generally a form of book you don't come across much outside of childhood and I felt it was a good fit. I'd never made a pop up book before this (turns out it's super complicated) so I was very lucky to have the assistance of my very talented colleague, Josh Gorle, as well as some very informative books from the Toronto Public Library throughout the process. Watch the lyric video for "Straight to Hell" below. In addition to the new clip, Hollerado have further fleshed out their farewell tour, adding a series of new Canadian dates set to take place this fall. You can see their newly updated schedule below. Retaliation Vacation is due out June 7 via the band's own Royal Mountain Records.